I’m not entirely sure where to go with this review. It’s a dramatized version, of a real story about saving three whales in Alaska. I mean, what do I do with that? It’s hard to write about true stories, you can’t judge the plot because it actually happened. What you can judge though is what they choose to show and how it’s paced. While what they chose to depict is perfectly fine if a little…lacking, but it’s the pacing that’s a bigger issue. The heart was trapped under the ice too. It didn't make it. And, we’re done. Yes, stories are about solving problems. But what makes stories compelling is seeing how those problems are solved and the solutions come almost as fast as the problems arise. What really makes this irritating is that there is a great deal of archival footage spliced into this film. It took place in 1988, it’s not like this was an “off-the-grid” time, there’s even more footage spliced into the end credits. 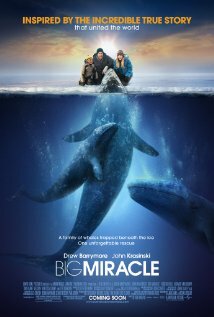 It feels like this film was locked into a runtime limit and the stories of how this coalition of people saved these whales was lost on the cutting room floor. What we’re left with is 107 minutes of awkward, fast-paced, and exceedingly boring environmentalism. Based on the title and subject matter I feel like they were going for heartwarming, but the heart was edited completley out. Also, the sheer amount of reporters on the scene was enough to convince the audience that this was a worldwide fascination, so the uninteresting scenes involving the little girl in Anytown USA watching the news, doing her current events report, and staring wistfully at Alaska on her glowing globe was over the top and took time away from giving the audience any emotional connection to the story. The cast does their best with the material. John Krasinski is particularly good as the reporter that broke the whale story. But, the subplot of his love life vs career path vs unwavering idealism takes up too much time- it ends up feeling like the emotional core of the piece which is grossly misdirected.